Pattern? Done! Supporting Video tutorials? Not started! But it's OK—since my local Michaels doesn't yet carry the complete line of Loop & Thread (their own) brand yet--and my semi secret socks are designed using the Loop & Thread sock yarn. Now what? Other pair of socks? No way! I already have knit 6 pairs this year, and summer is good sock time, so I know there will be at least 3, if not 4 knit by summers end. My cashmere gloves? Well--. but it was 80° (plus) yesterday, with high humidity, and cashmere is so warm in hand. I just couldn't bring my self to pick up the mini skeins and cast on. A hat –There's an idea! A hat—and here is the yarn—acrylic and rayon—not too warm. A lacy summer hat. A free style hat. So now 2.5 (or 5 inches--depending on how you measure) later—a beginning of a hat—a lacy brimmed summer hat. 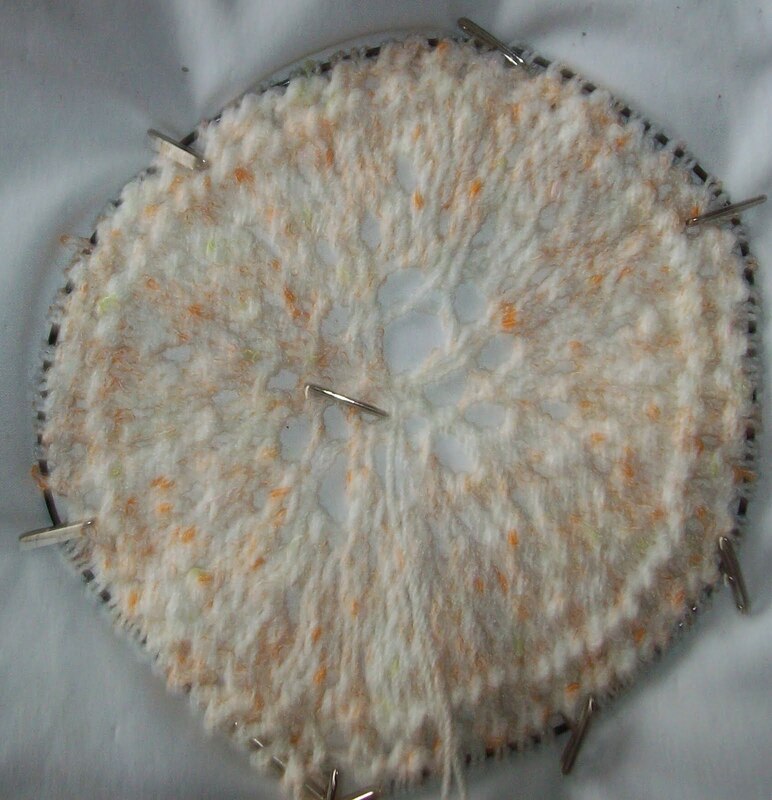 There are 90 stitches now and I think the crown will be maxed out at 120—then the sides (with no increases) will be knit. The band is likely to be a simple set of beading—with a cord threaded through latter. I just cast on and started—with a vague plan in mind for the stitch pattern-something flower like. I am making an effort to document--so if you like, you might end up with a chance to knit one just like it for your self. I increased too rapidly--(is was beginning to ripple) so a few rounds on no increases, and then a pattern element (the lace so far isn't so much real lace (ie, a specific pattern) as it is just regular increases--(orderly)--and somewhat open. But there is a pattern(a stitch pattern) to come. Not much of a pattern—a fast easy design—with luck—it will be done by the beginning of next week when the pool opens. I wish the pool was open NOW (and for the holiday weekend—but it doesn't open till June 1. The 5 day forecast is for warm, sunny, humid days—till Wednesday, when we are likely to get some rain! My knitting (and blogging, and readership) falls off every year in the heat of summer- I guess I am not the only one who doesn't knit much, and instead spends daylight hours enjoying the out doors. Clothes that have been too tight for the past 10 years, once again fit. I am no lightweight, (nor am I sporting a svelte figure)—but there is a bit less of me. And that's a good thing.